What is the first step in podosome assembly? Podosome initiation and assembly is highly regulated, both spatially and temporally. Dendritic cells best exemplify the temporal regulation of podosome formation. 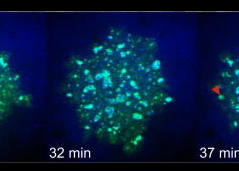 Following activation by an antigen or inflammatory cytokine, immature dendritic cells have a small window of time, roughly 6 hours, during which podosomes are able to form. This window correlates with the development of immature dendritic cells into mature dendritic cells that are no longer able to form podosomes . During this maturation process, immature dendritic cells migrate from their source, through the bloodstream or lymphatic system, into the spleen or lymph nodes where they are needed to present antigens to T-cells. 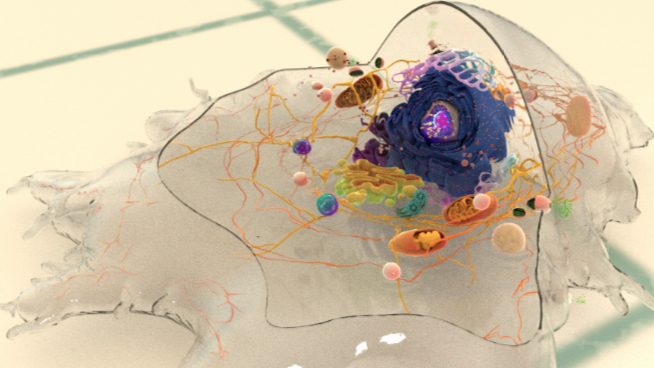 The function of podosomes during the maturation process is still under investigation, however it has been suggested that their matrix-degrading ability promotes dendritic cell migration by breaking down connective tissue barriers . (A) The actin core of the podosome (light blue) includes several proteins that promote actin nucleation. The Arp2/3-Cdc42-WASP-WIP complex facilitates actin nucleation and branching proximal to the plasma membrane, whilst cortactin (or its leukocyte-specific homologue HS-1) acts to stabilize branch points more distally . It is not yet clear whether the attachment of the actin core to CD44 receptors occurs via branched or unbranched actin filaments or what protein complex could facilitate this link. Radial actin filaments (dark blue) emanate from the actin core [ 21779330] and link to cell surface integrins that form the basis of the adhesive ring complex. The radial network is speculated to exhibit mechanosensory potential , involving the transmission of forces in a myosin II dependent manner. (B) The ring complex is formed by a circular array of integrins, to which several other proteins also localize. These proteins include the signaling proteins, Src kinase and Pyk2, the adaptor protein p130CAS, the actin severing protein gelsolin and the focal adhesion-associated proteins talin, vinculin, paxillin and α-actinin. It should be noted that though gelsolin localizes to this ring structure, it is not absolutely required for podosome formation . Spatially the nature of the extracellular matrix (ECM) and the distribution of ligands within it, have been shown to affect the initiation of podosome assembly, as demonstrated by experiments with macrophages on fibronectin. Uniform distribution of fibronectin was shown to promote podosome assembly, however when fibronectin spots were created on a micropattern, podosomes tended to form outside of these spots . The somewhat contradictory nature of these results are not yet fully understood, however they do illustrate that the detection of different geometrical arrangements of ECM ligands by cells affects their ability to initiate podosome formation. Podosome initiation occurs in response to interactions between ECM ligands, such as fibronectin and fibrinogen , with cell surface integrins. Distinct integrins are recruited to the adhesive ring structure of podosomes, namely integrin β2 in dendritic cells and macrophages and integrin β3 in osteoclasts . Integrin β1 is also postulated to localize to podosomes, but to membrane sites underlying the actin core . Integrin activation is therefore key to podosome initiation. The cell surface glycoprotein and receptor, CD44, is also reported to engage the ECM and anchor the actin core of the podosome to the underlying membrane . The Arp2/3 activator, WASP (Wiskott Aldrich Syndrome protein) is suggested to regulate integrin receptor clustering during podosome initiation, by an as yet unknown mechanism . This is inferred from dendritic cells lacking WASP that show a diffuse distribution of integrin β2, rather than the concentrated, ring distribution observed during podosome formation. Although these cells are able to maintain adherence to the underlying substrate via integrin β1-containing focal adhesions, they show decreased adherence to the integrin β2 ECM ligand, ICAM-1 (Inter-Cellular Adhesion Molecule 1). The regulation of podosome formation has so far been limited to discussing the biophysical events of protein-protein interactions. However, recent experiments have provided insight into upstream regulatory events that control the initiation of podosomes at the genetic level. This refers specifically to micro RNAs (miRNA). miRNAs are short (21-25 nucleotides in length) strands of non-coding RNA that negatively regulate gene expression. They do so through binding complimentary sequences in the 3’ untranslated regions of messenger RNA (mRNA) and thereby prevent translation of the mRNA transcript (reviewed in ). miR-143 and -145 have been shown to prevent podosome formation in vascular smooth muscle cells (VSMCs) and so regulate their transition from a differentiated, contractile state to a de-differentiated, migratory state . This was demonstrated both in vitro and in vivo through the use of miRNA-143/145 knockout mice, whose VSMCs showed an increased propensity to form podosomes. Further analysis confirmed the need for miR-143 and miR-145 down-regulation to permit podosome formation. The involvement of miRNAs in podosome formation in other cell types has yet to be studied, however this example demonstrates the need for post-transcriptional regulation in order to prime the cell to respond appropriately to extracellular stimuli. 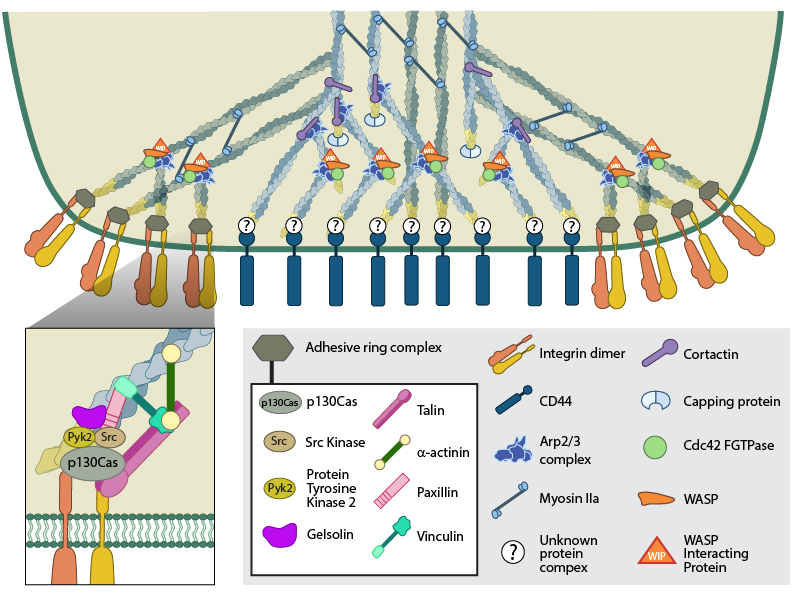 Following detection of the required external stimulus, via mechanosensing integrins, the actin network is commandeered to facilitate construction of the podosome. Actin assembly is known to occur both from the extension of pre-existing lamellipodial networks, as well as de novo . How does traction force affect the nature of adhesion structures like podosomes?